［引用文献］石原金由, 宮下彰夫, 犬上牧, 福田一彦, 山崎勝男, 宮田洋. (1986). 日本語版朝型-夜型(Morningness-Eveningness)質問紙による調査結果. 心理学研究. 57: p87-91. ［引用文献］土井由利子 (1998). ピッツバーグ睡眠質問票日本語版の作成. 精神科治療学 3: 755-763. ［引用文献］Kitamura S et al (2014). 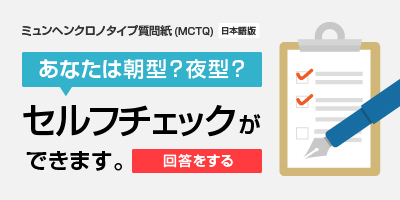 Validity of the Japanese version of the Munich ChronoType Questionnaire. Chronobiol Int. 2014 Aug;31(7):845-50. COPYRIGHT (C) 2012-2014 DEPARTMENT OF PSYCHOPHYSIOLOGY, NIMH, NCNP. ALL RIGHTS RESERVED.